I have a lot of photographs that I’ve taken during my travels and recently started painting from them. 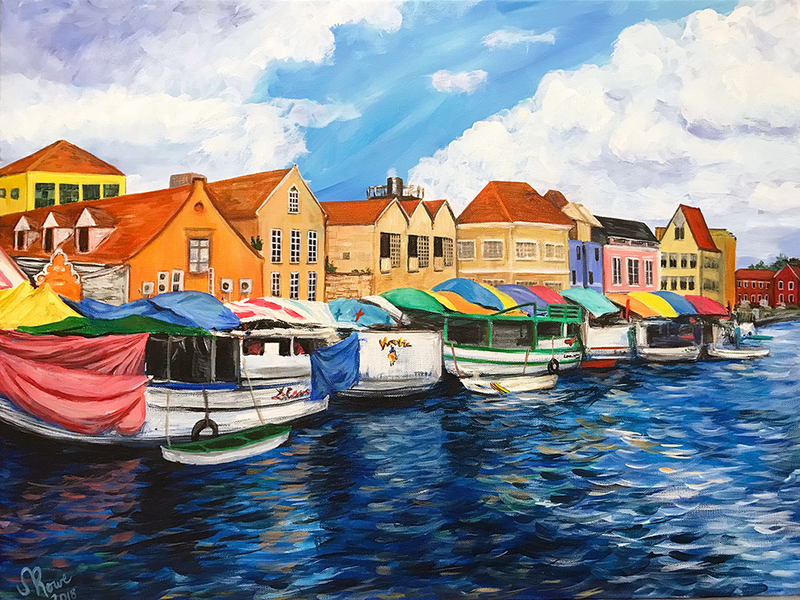 For this show, I decided to paint the floating market in Curaçao (above) from my visit in 2010. The market had been around for over 100 years and sadly, it just closed in March due to the Venezuelans not being able to get fruit from their country due to border closure. Below are some additional landscapes I worked on earlier this year based on a trip I took to France in the summer of 2012. While the Seine scene is spoken for, the Monaco garden is still available. For this year’s 6×6 submissions, I chose to paint some notable Rochester favorites for the Pantone Series: Tanvi Asher, designer and owner of Peppermint; Shawn Dunwoody, artist and activist; Mark Cleary, philanthropist and owner of City Blue; and the great Wendell Castle, furniture artist and father of American Craft. This is an annual fundraiser and all works are sold for $20 each, with all proceeds going to RoCo. This a seriously good deal, folks. Purchases can be made at the gallery or online through the RoCo website. I met Melissa Huang last year shortly before she departed from Main Street Arts. 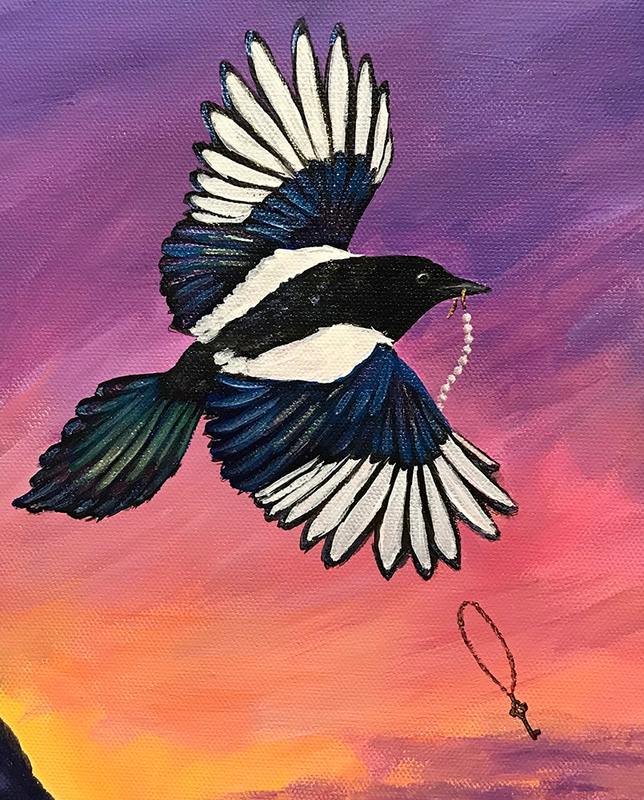 She is both a fantastic artist and curator who has been organizing rotating shows at two adjacent businesses in Rochester: NORCHAR Real Estate and Haus Capital. Since she will be relocating to pursue her MFA in Georgia (Rebecca Lomuto will be taking over as curator), I’m happy to have been selected for Pearls Before Swine, along with two very talented artists, Cat Clay (Sabra Wood) and Aaron Delehanty. For this show, I’ve created a new series of seven paintings and a few recent favorites will also be featured. You can always check out the latest previews of my work on Instagram. More specific info on this series can be found here. I’m thrilled that one of my Yama Niyama Llamas made it into Trestle Gallery’s Small Works show. Raccoons appear to be having a moment! Additionally, I’ve had some recent coverage which is always appreciated. (585) Magazine featured one of my Pantone Series pieces in the May/ June Grow issue and other recent work is presently featured in the June online issue of Chaleur. If you are in or near any of these galleries, please feel free to stop by and check out the work in person.